The claim is only 19 words long. It relates to what seems like the abstract idea of web searching. It takes some chutzpah to take that up to the Board. But that is what happened in SN 12/374,372. And what if I told you that the applicant took this case up to the PTAB twice - and won a reversal both times?! Crazy? No, it’s a fact. This applicant ain’t messin’ ‘round. The Examiner tried some prior art rejections in the first appeal, but could not really put together a cohesive and logical rejection. So, naturally, after the first appeal the Examiner switched over to focus on Section 101. The problem for the examiner is Enfish. These claims really do fit well with that case as they are all specifically directed to web applications and “clicking” and web searching in particular. The examiner tried to steer things back to Electric Power (because of course once you get that case in the mix the applicant can almost never win). But the PTAB was having none of it. They first focused on the web-centric problems described in the specification. From there, the Board then concluded that the Examiner's sweeping reliance upon Electric Power Group overgeneralized the claims. 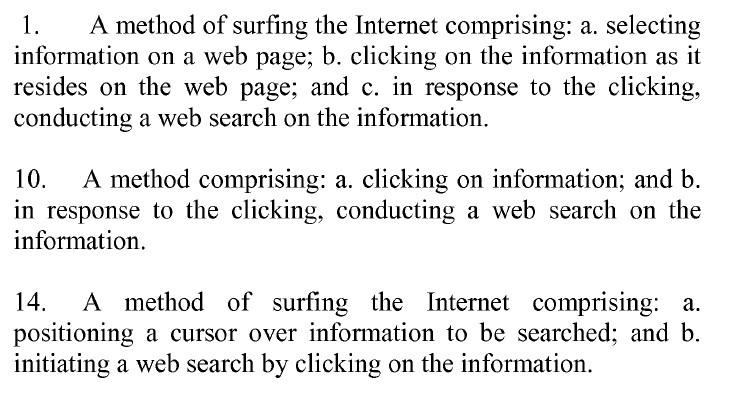 Likewise, the Examiner's findings with regards to the abstract idea of "performing a routine and conventional Internet search using clicking" overgeneralized the claimed invention where the combination of the steps reduces the actions required by the user to perform the same result. So, internet-based inventions may be looking up at least with respect to Section 101 and the new 2019 guidlines. Newer PostDetails in the Specification - Good or Bad?